SARCASM was born 1990 from the ashes of THIRD STORM (Heval Bozarslan - vocals) and EMBALMED (Fredrik Wallenberg - guitar) in Uppsala, Sweden. While the death metal scene in Stockholm was enormous, the scene in Uppsala was rather poor back then, there were only a couple of bands who played this kind of brutal metal. In the beginning the band had trouble finding a suitable drummer who had the same passion for this extreme music as Heval and Fredrik. Finally Henrik Forslund who actually is a guitarist agreed to play drums and bassist Dave Janney (R.I.P.) completed the line-up. Inspired primarily by american underground bands and the idea was to create the heaviest and scariest death metal at that time. 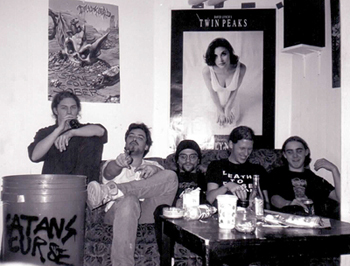 Til the end of 1992 the band managed to record three demo tapes (“Fleshwaste”, “In Hate” and “Soul Enchantment”) “In Hate” (nov 92) was the one that was seriously spread and dropped like a bomb in the underground scene. It received very good reviews and people actually embraced this kind of death metal which was more popular a couple of years before, but something fresh was needed for the genre for it to survive but people saw quality in SARCASM’s music and that’s what mattered in the end. But things were starting to change at the very beginning of 93 anyway, the band wanted new elements in the mix, 17 songs of the same flavor and all about corpses, gore, hate etc was enough. Both songs (Never After and You Bleed (I Enjoy) which became the “Dark” demo had nothing of that kind. The lyrics changed completely and melodies started to creep into the music which was very new for this genre at that time. But of course the band didn’t want to lose its furiousness and the brutal aspect of this music, the balance was found and the band was very satisfied in this new dimension which much could be explored and was explored, and with a very fast pace. Another four songs demo was recorded in the summer of 93, the band this time took things a step further and showed people how well and elegant you can execute death metal with songs like Through Tears Of Gold and Scattered Ashes. SARCASM is now a tasteful band? How could that be? Well 1993 was a very exciting year for death metal, a lot of bands became “melodic” and change was needed and welcomed by many. People loved how SARCASM had evolved and wanted more. As the songs became more complex and melodic, a second guitarist was more than needed. Drummer Henrik took over the rhythm guitars, a position that was his in the beginning, and the drummer who was recruited was Oscar Karlsson (R.I.P. ), who also was in DEFLESHED at that time. The band was very lucky to have found a drummer like Oscar, the songs demanded technical skills and he was perfect! Three new songs were written, along with Through Tears Of Gold, SARCASM entered the studio february of 94 and recorded these four songs which became their classic demo tape “A Touch Of The Burning Red Sunset”. The reaction to this demo was stunning, it sold like hell and only good reviews were pouring in and everyone waited for a record deal. During the recording of that demo, guitarist and songwriter Fredrik Wallenberg decided to leave the band and move to Gothenburg. Sad and strange as it was, the band quickly found a replacement, Anders Eriksson joined the band just after the demo release. A record deal arrived, everything look good at first so the band booked the same studio in the summer of 94 and recorded their debut album “Burial Dimensions”. During the recording process for this album the label started to make demands and changes, that was unacceptable of course so the deal was cancelled before the album was even complete. By the end of the summer that year the band realized they couldn’t go on without Fredrik, there were no new songs written after he left and much effort was not given to create new tunes, and the sound and atmosphere would not have been the same without the key member and the frustration over the record deal that went flat, there was no energy left to continue. The album was not spread or even sent to labels, it remained unheard and unreleased for many years. In 97 the band reunited for a gig in their home town and played the entire “Burial Dimensions”, then everything went silent again ‘til Breath Of Night Records in 1998 released the compilation CD “A Touch Of The Burning Red Sunset”. Demos chosen for this compilation were “In Hate”, “Dark” and “A Touch Of The Burning Red Sunset”. Two years later Italian label Danza Ipnotica released 7” picture disc “Scattered Ashes” with Pile of Bodies on side 2. Both songs were taken from the unreleased album “Burial Dimensions”. And finally in 2011 the full length was released together with the bands six demo recordings, this compilation entitled “Never After – The Complete Recordings” was released only on 3-LP box-set by To The Death records. Also released was a limited “die hard” edition with a bonus EP with five rehearsal songs that was never recorded in the studio, this made the compilation even more complete, the idea was to include every single song the band have ever written in their short career, nothing was left out. Although vinyl format has made a big comeback, there are of course people who still buy CD’s and have waited for this compilation to be released on this smaller digital format so finally in 2015 Dark Descent Records released it as a 2-CD entitled “Burial Dimensions”. In addition to that, the full length was released by Dark Descent on vinyl in july 2016. During all these recent releases the band wanted to get back together and create music again. Henrik wanted to switch to bass, so the band had to find a second axeman and Peter Laitinen was the perfect guy for the job. Peter, besides being an excellent guitarist, is also a great songwriter and an old fan of the band, he understood the concept and atmosphere more than the rest of the us so he began immediately writing tunes and with an incredible pace. Within six months since he joined, the band had material for a full length album. As the band was ready to begin with the pre-production process, Oscar Karlsson sadly passed away in march of 2016. The band didn’t know whether to split up or continue, after a break the decision was made to carry on and to honor Oscar’s memory, since he was the one who kept asking for new songs and loved the new material, the band thought it’d disrespectful to just throw away the songs and quit. In may, after a couple of months break the band asked Matte Modin to join the band, he liked the new material and decided to join so the band entered the studio in the summer of 2016 to record their second album “Within the Sphere of Ethereal Minds”. But the problems wouldn’t stop there unfortunately. During the recording, due to health problems Fredrik decided to leave the band once again and Henrik realized he had very little time for the band as he was working on his several businesses which took more of his time. Neither of them were part of the songwriting of the album, but still it was sad they left. So once again the old member, Anders Eriksson replaced Fredrik Wallenberg and the replacement for Henrik was Jonas Söder. A deal was signed with Dark Descent Records and “Within the Sphere of Ethereal Minds” was released April 28, 2017. The album received good response and great reviews were pouring in. In short, many agreed that this was not another “comeback album”, the band means real business with this release. 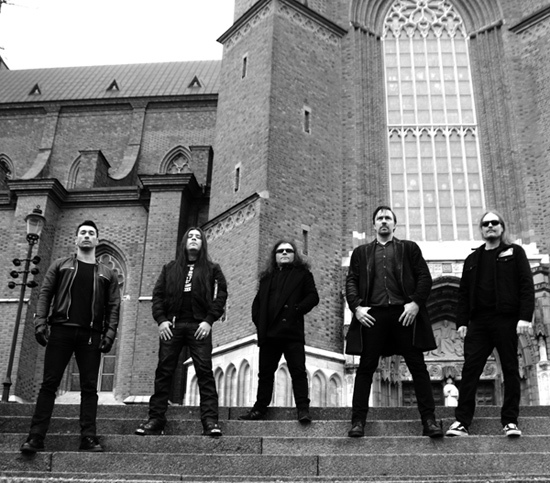 Shortly after the release, Matte left the band to focus on his other projects, so Theo Härkesjö joined as a session member until September that year as Alvaro Svanerö joined the band as a full time drummer. Also the same month, Darkness Shall Rise Productions released a strictly limited deluxe cassette box-set including all the band’s demotapes in their original layouts, something that was much sought after. 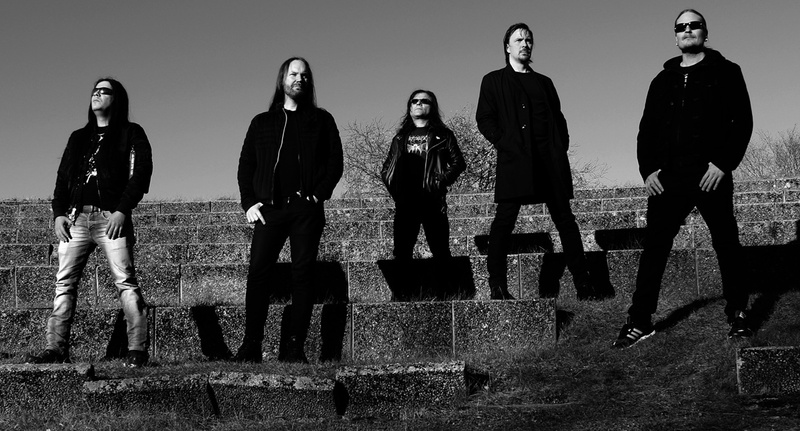 After some local shows the second half of 2017, the band began to write new material and entered once again HSH Studios in Uppsala the fall of 2018 to record the next album for a 2019 release. The album was recorded by Alvaro Svenrö and Philip Borg and also mixed at HSH by Alvaro. Like the previous two albums, 8 songs were recorded, the musical direction on the new record is true classic Sarcasm sound, but heavier, faster, deadlier and catchier than everything before. And the this also is a thematic album like the other ones. For once the band has recorded a record without tons of problems surrounding them. Everything went incrediblly smooth this time, a record the band is very proud of. It will be released the fall of 2019..